Unsteady propeller blade loads are important to consider in the design of the propulsion system in order to avoid problems with noise and vibrations. This is normally done through an analysis of the average wake field flowing into the propulsor in order to correctly match the different components of the propulsion system. 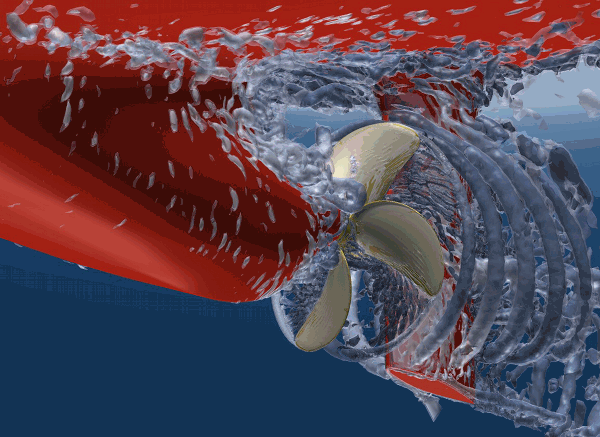 As computational resources increase, it starts to become possible to better study the impact on the natural wake flow unsteadiness and how this influences the behavior of the propeller. 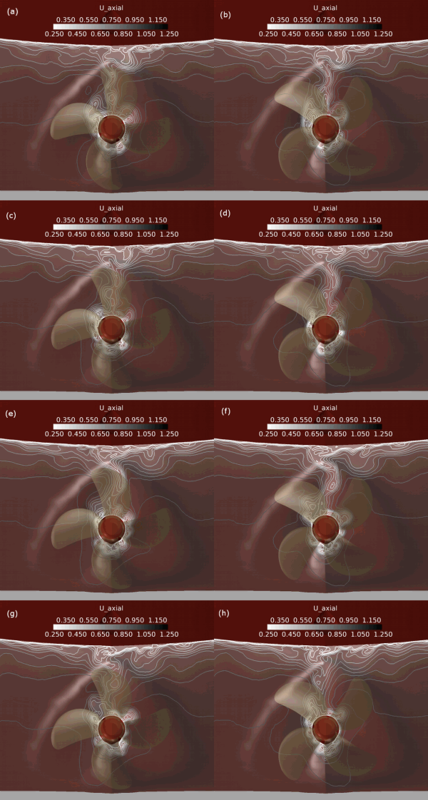 The work described here is part of a feasibility study performed within the EU-funded research project STREAMLINE to investigate different performance and computational aspects regarding the flow around a propeller operating in a ship wake. The simulations are performed in OpenFOAM® 2.2.x  using LES (Large Eddy Simulation). The interest concerns both how the sliding mesh implementation in OpenFOAM performs and propulsor performance parameters including how large a variation in the propeller flow the resolved transient wake field incurs, how cavitation behavior is affected and the impact of different appendages, such as a pre-swirl stator installation. The case studied is a 7000 DWT chemical tanker in model scale with overall length = 5:86 m at the scale factor of 1:16.5. The model has been used as a base line vessel in the project. It was designed by CNR-INSEAN, and an extensive experimental and computational database has been collected by the partners in STREAMLINE with results presented in e.g. [8, 10, 4, 9]. The simulated conditions presented in this paper are for model ship speed of 1.773 m/s, corresponding to design speed 14 knots in full scale, and with a propeller revolution rate of 8.92 rps. To simplify the set-up somewhat, computations were made for a double body model, so the effect of the wavy free surface is neglected. Judging from available experimental data, this is however a minor approximation at this speed. The simulations are performed with a rudder. The simulations have been run using an implicit LES approach, where no sub grid model is used for the energy dissipation and instead we rely on numerical diffusion to be a sufficiently good emulation of this process. 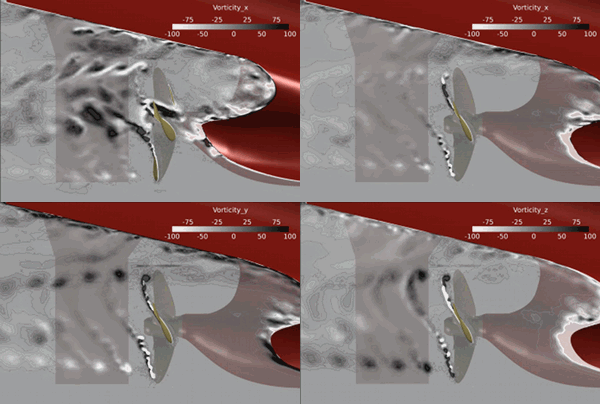 The reason for choosing implicit LES for these simulations is that we also run the case with a cavitating propeller, and for these flows we have normally used this technique. We have good experiences using this modeling technique for both wetted and cavitating flows, see [3, 2, 7] and the references therein. The computational domain is a half cylinder of radius 1.5 times the model length and extends 1 model length forward of the bow and 2 model lengths aft of the transom, see Figure 1. This is a relatively small domain but as no surface waves are simulated it is deemed sufficient. The mesh was generated using Pointwise and consists of in total 19.6 million cells split into one cylindrical (rotating) region around the propeller and one region for the rest of the domain (see Table 1). To have the best possible control on the mesh quality around the propeller, a structured surface mesh was manually created on the blades and the hub. From this, a boundary layer mesh with hexahedral cells was extruded in order to capture the detailed surface flow. The remaining volume of the propeller cylinder was then filled with unstructured tetrahedral elements. In order to capture the blade wake and improve the propagation of the tip vortex, a refined region was created by extruding a support surface, where smaller cell sizes could be specified, behind the trailing edge of the propeller blade and back to the propeller domain boundary. Figure 1: The computational domain (left) and the location of the sliding grid interfaces (right). For the hull mesh, the complexity of the hull, especially between the bulbous bow and the symmetry plane and in the aft between the propeller region and the boss and the rudder, made it difficult to create a high quality structured mesh. Moreover, the flexibility in unstructured gridding to cluster cells close to the hull surface and in the stern region together with a short time to produce a high quality grid made us instead opt for a completely unstructured grid. The hull surface was triangulated and cell layers of prisms were then grown into the fluid domain with a smooth transition to tetrahedra in the interior using the T-Rex (anisotropic tetrahedral extrusion) feature of Pointwise. The mesh is refined in the propeller wake and around the rudder and its wake (see Figure 2) in order to allow the propagation of the propeller tip vortices. 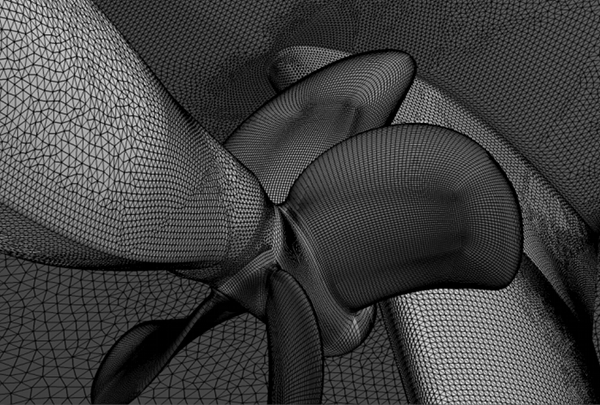 The complete mesh was generated on a laptop and the two domains were separately exported using the native OpenFOAM exporter in Pointwise and later merged in OpenFOAM. The mesh resolution is decent for a model scale LES, with typical cell sizes in the aft body boundary layer and on the propeller of (Δx+;Δy+) = (100; 5), where Δx+ represents the longest surface cell edge and Δy+ the wall normal cell size. Figure 2a: Surface mesh of propeller and aft body. Figure 2b: Cut through the refined propeller wake. The experiences of using the OpenFOAM 2.2.x implementation of sliding grids, based on AMI (Arbitrary Mesh Interface) , are in general good. No detailed check on continuity or interpolation errors was performed in this study except for an “eye” norm check of continuous flow behavior and no problem of dissipation or generation of spurious solution has been detected. This is demonstrated in Figure 4 where the vorticity components are plotted in planes across the propeller disc and the AMI interfaces. Later studies have quantified and confirmed this first impression that the AMI implementation is well behaved. The visualizations presented were created using Fieldview® from Intelligent Light. We noted that in this case of non-conforming mesh interfaces, it was necessary to use the native OpenFOAM data reader in Fieldview to avoid spurious visualization errors along the AMI interfaces. The speed performance was measured in two ways, both through a weak scalability study of the open water propeller, using a slightly less dense mesh than in the final simulations summing up to around 3.5 million cells. The case was then run using AMI on 16, 32, and 64 cores, as well as on a single mesh without a sliding interface but where the whole domain was rotated. The results are presented in Table 2, and the conclusion is that the parallel performance is decent and will not cause a major problem thus allowing for large complex problems as reported here. A general overview visualization of the flow is presented in Figure 3 through an iso-surface of ǁ∇ x vǁ - ǁ∇vǁ; this structure function is a simple-to-compute approximation to the Q-function. We can here see that substantial flow structures are entering the propeller. Furthermore, the simulation nicely captures the smaller scale vortices in the blade wake that later merge with the tip vortex. In this condition we observe flow separation along the trailing edge of the propeller blades, although not obvious in this particular visualization. We also remark that the tip vortex interaction with the rudder is well captured and agrees qualitatively with published results on open water propeller/rudder interaction . Figure 3: Flow visualization based on an iso-surface of ‖ ∇ × v ‖ − ‖ v ‖. Figure 4: Contours of instantaneous vorticity, in (upper left) the x-component offset by RP =4 and in the the x, y, and z-components respectively, offset by RP =2, where RP is the propeller radius. Wake unsteadiness is visualized in Figure 5, where contours of the instantaneous axial velocity component just upstream of the propeller are shown. Unfortunately, the still snapshots are not sufficient to see the wake behavior clearly, but from an animation of the full sequence, it’s clear that an instantaneous sharp wake peak is always present but moves slowly from side to side of the centre line. This implies that for propeller design with respect to noise and vibrations, a sharp wake velocity deficit should always be considered, and the wider average wake is clearly not relevant. It would be highly interesting to investigate this behavior in full scale, where the average wake is much thinner. In Figure 6, the transient propeller thrust is plotted, both for the individual blades (colored lines), the total thrust (divided by four; black line in (a)), and the phase average taken over the plotted revolutions [black line in (b)]. Looking at the total thrust, the blade passing frequency is obvious in the thrust variation, but we also clearly see a slower variation that presumably is related to the wake unsteadiness. The deviation from the average is overall quite modest, but a few peaks are noted, as well as occurrences of a phase shift between different revolutions. The forces presented here are based on a simulation time of six to seven propeller revolutions which is not sufficient to give reliable frequency content information. The simulation is still running in order to sample longer times and deepen the analysis. Furthermore, we are also performing simulations on the same hull with pre-swirl stators mounted in order to get information on how the unsteady blade loads are influenced by such an energy saving device. Finally, cavitation behavior simulations are also in progress. Unfortunately for this research, however, it has turned out that at relevant conditions this vessel is almost cavitation free, and new conditions need to be identified in order for us to learn more about the feasibility and accuracy of a cavitation simulation in this complex configuration. 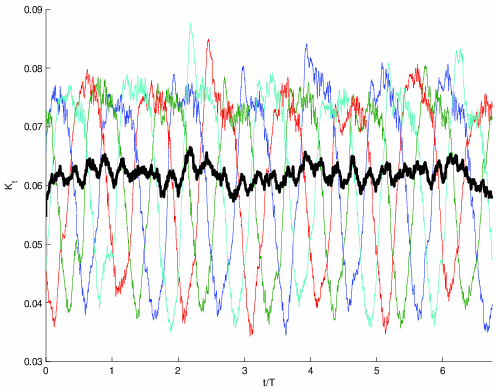 Figure 6: Time series of individual blade thrust and the total thrust (divided by four) (top), and individual blade passages and phase average over one revolution of the previous data (bottom). This work has received funding from the European Union Seventh Framework Programme (FP7/2007-2013) under grant agreement No.233896. Computational resources have been provided by Chalmers Centre for Computational Science and Engineering, C3SE. Mr. Reza Mehdi Pour is acknowledged for performing the scalability study. Visualizations where made in FieldView from Intelligent Light. R.E. Bensow and G. Bark. Implicit LES prediction of the cavitating flow on a propeller. J.Fluids Eng., 132(4), 2010. R.E. Bensow and M. Liefvendahl. 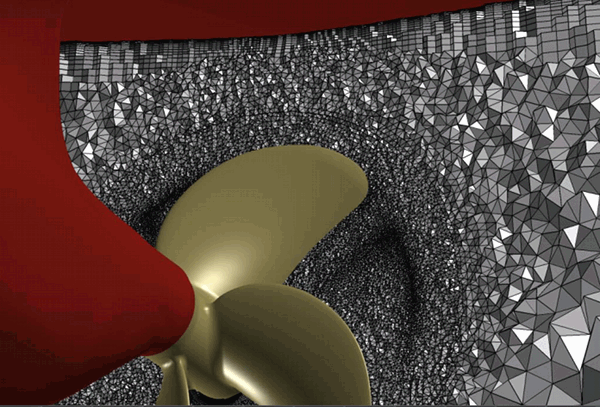 Implicit and explicit subgrid modeling in LES applied to a marine propeller. Number AIAA-2008-4144, 2008. G. B. Deng, P. Queutey, M. Visonneau, and F. Salvatore. Ship propulsion prediction with a coupled RANSE-BEM approach. V International Conference on Computational Methods in Marine Engineering, MARIN2013, Hamburg, Germany, May 2013. P. E. Farrell and J. R. Maddison. Conservative interpolation between volume meshes by local galerkin projection. Comput. Methods Appl. Mech Engrg, 200(89), 2011. M. Felli and M. Falchi. Propeller tip and hub vortex dynamics in the interaction with a rudder. Exp Fluids, 51(5):1385, 2011. A. Feymark, N. Alin, R.E. Bensow, and C. Fureby. Numerical simulation of an oscillating cylinder using large eddy simulation and implicit large eddy simulation. J. Fluids Eng., 134(3), 2012. A. Pecoraro, F. Di Felice, M. Felli, F. Salvatore, and M. Viviani. Propeller-hull interaction in a single-screw vessel. Third International Symposium on Marine Propulsors smp’13, Launceston, Tasmania, Australia, May 2013. P. Queutey, G. B. Deng, E. Guilmineau, and F. Salvatore. A comparison between full ranse and coupled RANSE-BEM approaches in ship propulsion performance prediction. 32nd International Conference on Ocean, Offshore and Arctic Engineering, OMAE2013, 2013. A. Van der Ploeg and E.J. Foeth. Optimization of a chemical tanker and propeller with CFD. V International Conference on Computational Methods in Marine Engineering - MARINE2013, Hamburg, May 2013.